Plantation Island is a place for everyone, romantic couples of all ages, families with children and groups. From the very first moment you arrive you will experience the warmth and friendliness of our staff who will make your holiday one of the most memorable you will ever experience. At Plantation Island Resort all accommodation options for Bures and Hotel Room feature: Air conditioning, Direct Dial IDD Telephones, Refrigerator, Tea/Coffee Making Facilities, Overhead Fans, Patios or Balconies, Cots available free of charge, All bathrooms feature shower, toilet, vanity and hand basin. 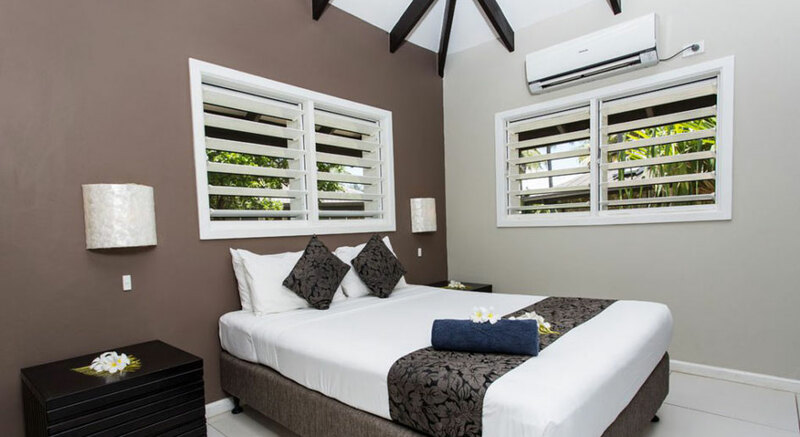 You can choose from a beachfront bure, 2 bedroom garden bure, 1 bedroom garden bure, poolside room, studio garden bure, beachfront hotels rooms and a standard hotel room. Plantation island Resort offers a wide range of resort activities to make your stay special. Listed below are just some of the fun and rewarding activities you can indulge in while staying at Plantation Island Resort. On Land: Lawn bowls green, Volley ball court, Rugby oval, Netball field, Mini golf, Running track, Nature walks, ood carving, Coconut tree climbing, Kava ceremony, Art gallery, Handicraft center, Therapeutic massage, Hair braiding, Traditional Cooking Lessons, Native Medicine Lessons, Basket / Hat Weaving, Limbo, Bingo, and Frog / Crab Races. On Water: Semi submersible, Snorkeling, Snuba, Handline fishing, Water skiing, Wake Boarding, Knee boarding, Banana ride, Windsurfing, Hobicats, Canoeing, Swimming, Surfing Safari, Dolphin safari, Moonlight cruise, Sunset cruise, Island hopping, Shell Village trip, Game fishing and Honeymoon Island Snorkel. Complete your experience at Plantation Island Resort with a full body combination massage, or relax in our Hair Salon for one of the many treatments they offer their guests. From a standard hair cut to coloring, streaking and straightening services as well as braiding, manicures and pedicures the can help you look your best for the beach, dinner or even your wedding. Children of any age are permitted at the resort at any time of the year. Plantation Island Resort is a haven for kids as well, with a full range of activities that are sure to entertain all ages. Additional nanny and child minding facilities are also available. Kids can join the ‘Coconut Club’ for FREE. Your wedding is a once in a lifetime occasion. Plantation Island Resort handles about 100 Weddings a year and offers exclusive island wedding packages. A variety of locations and arrangements can be made to suit any budget.